A Boeing 707 cargo plane flying from the Central Asian nation of Kyrgyzstan has crashed in Iran's Alborz province after it overshot the runway during landing. All 16 people on board the aircraft but one are presumed dead. 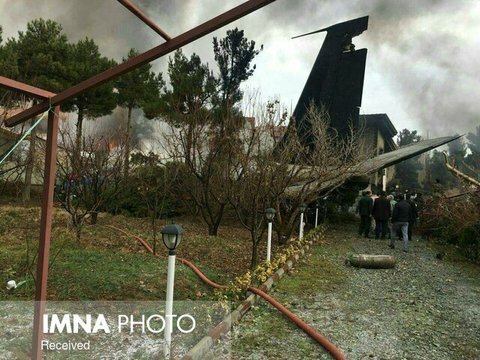 Iran (IMNA) - The military cargo aircraft crashed and caught fire near the city of Karaj on Monday morning while attempting to land in the wrong airport. "A (Boeing) 707 cargo plane, which was carrying meat, took off from Bishkek in Kyrgyzstan and had an emergency landing at Fath airport this morning," the Iranian Army said in a statement on its website. The head of Iran's emergency department, Pirhossein Kolivand, said the bodies of seven people had been found. The flight engineer is reported to have survived the crash but is in critical condition. Initial reports suggested that the plane was due to arrive at Karaj's Payam Airport but the pilot took the plane to the Fath airfield by mistake, which is not suited for large cargo aircraft. The pilot then lost control of the plane, ran out of the runway and hit the walls that separate the airport from neighboring residential areas. There have been reports of damage to some residential facilities which were reportedly vacant at the time of the crash. Reza Jafarzadeh, a spokesman for the Civil Aviation Organization of the Islamic Republic of Iran (CAO.IRI), told Tasnim news agency that the plane had "caught fire." Other reports suggested that the doomed aircraft's black box had been found near the crash site.